There's no faster way to somebody's heart than to buy them a great PC game. With that (and this week's Black Friday sales) in mind, here are our picks for PC games to stuff in that special someone's stocking. 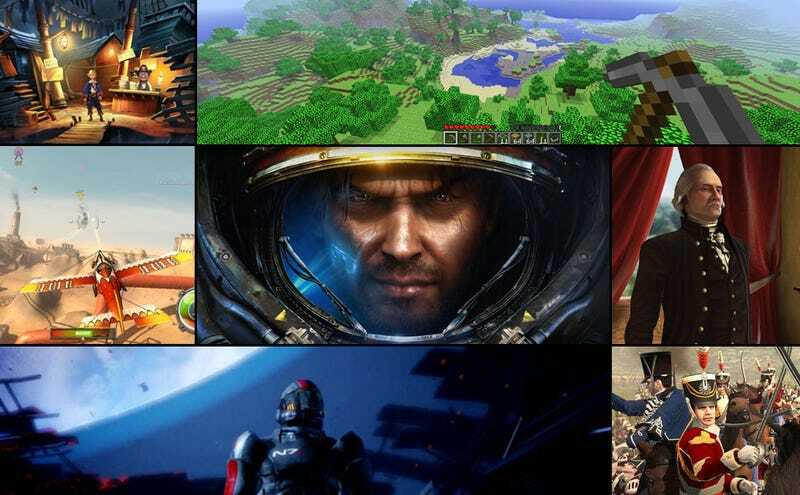 Whether you're looking for a strategy game, shooter, role-player or something completely out of left field, here are ten best PC games you could wrap up and surprise someone with this holiday season. Ideal Player: History buffs with a desire to see their social lives and marriages ruined. What's It About? You take control of a civilization in its earliest days, as you guide your people throughout human history advancing their knowledge, exploring new lands and taking the sword to your neighbours. Bang For Your Buck: Civilization IV came out five years ago, and people are still playing it. In many ways, this game is better than Civilization IV. Need me to paint you a picture? Ideal Player: Anyone who has ever had any contact with the first Starcraft. What's It About? The sequel to a game first released in 1998, Starcraft II takes you on a journey around the galaxy as the corrupt - yet strangely lovable - forces of humanity struggle to stay alive against an insectoid alien race that seems unstoppable. Bang For Your Buck: While the game's singleplayer campaign is a fairly lengthy (considering it's only 1/3 of the overall game), it's multiplayer where most of a player's time will be spent. Get hooked on Starcraft II and there's precedent for you to still be playing in twelve year's time. Ideal Player: Someone who isn't afraid to experiment with a game, really push at its edges to see what can be done with an open world and finite resources. What's It About? Minecraft puts you on an island and lets you fend for yourself. What begins as a struggle for survival eventually turns into an expression of your mastery over your domain, as frantic races for shelter at night give way to days spent building shrines in your own image. Bang For Your Buck: Minecraft will last as long as your imagination can power your daily routines. It's a game free of story or time limits, so if you can find something to do on the island that day, you've found another way to spend a day playing Minecraft. Ideal Player: Someone who likes a laugh and isn't afraid of some (at times) abstract puzzles to solve. What's It About? A shiny remake of a classic 1991 adventure game, the Special Edition of Monkey Island 2 drags one of the finest (and funniest) games of the 20th century right into the 21st. You play a pirate, Guybrush Threepwood, out on a quest for the treasure that can both make him rich and save his skin. Bang For Your Buck: It can be completed in a week or two of solid play, but you're in this one for the story, the puzzles and the humour, not replayability. Besides, it's cheap! Ideal Player: Flight sim fans who want the genre equivalent of a dirty one-night stand. What's It About? Dogfighter is an aerial combat game that takes the thrill of dogfighting and drops it in an arena-style online combat setting, ala Team Fortress 2 or Call of Duty. Bang For Your Buck: Depends how good you are! It's an online combat game, so as long as there are other people in the world up for a game, you've got yourself a game. Ideal Player: The kind of person who loves the explosions and freedom of a sandbox game but hates all that stuff like story and realism. What's It About? Just Cause 2 is about being dropped on an island and then running around for days blowing stuff up. There's something about an uprising against a totalitarian government amidst all the carnage, but you won't have time to pay attention since you'll be so busy blowing stuff up. Yes, this is a very "console" kind of game (it was also released on PS3 and 360), but the PC version's draw distance makes it such a pleasant experience we had to recommend it here. Bang For Your Buck: Just Cause 2's storyline wears thin pretty quick, but there's enough to do on the game's islands with your own imagination (and arsenal of destructive toys) that it should keep you occupied for a few weeks. Ideal Player: A history buff who isn't afraid to step down from the strategic level and get blood on the end of their bayonet. What's It About? Napoleon: Total War is a game that puts you in control of one of Europe's major powers during the Napoleonic Wars. Economic planning, trade routes, supply lines, military manouvres, you have to take care of all that sort of stuff on a strategic level. Then, when push comes to shove, you can take control of your armies and fight out battles in real-time on the field. Bang For Your Buck: Full games can take weeks. I myself have sunk over 180 hours into the game since its release, so yes, there is bang for your buck here. Ideal Player: Someone who isn't afraid of having their pants scared off. What's It About? Amnesia is an adventure game played in the first-person. Sounds like a pleasant Sunday's afternoon gaming, only Amnesia is a horror adventure game, and quite possibly one of the scariest video games ever made. Bang For Your Buck: It's not a time-sink like some of the other games on this list, but there is avenue for replays if the player wants to enjoy it a second of third time with a little of the tension relieved. Ideal Player: Fans of Japanese Role-Playing Games that would appreciate something a little different within the genre. What's It About? Role-playing games are always full of silly little stores selling items. Well, in Recettear, you're actually running one of them, making the game a refreshing combination of retail management and role-playing game. Bang For Your Buck: You can "finish" the game in around 10-12 hours, but if you really want to get out an explore and see everything Recettear has to offer, expect to invest at least 100 hours into the game. Ideal Player: Anyone who has ever liked anything to do with spaceships, aliens or quests to save the universe. What's It About? One of the year's best games is at its best on the PC, sharper graphics and a better control scheme making Commander Shepard's fight to save the galaxy a ride PC gamers will not soon forget. Mass Effect 2 blends role-playing with action-oriented gunplay, with a whole lot of entertaining chit-chat in between. Bang For Your Buck: The main game can take anywhere from 15-25 hours to complete, but thanks to the open-ended nature of the game - and the fact many conversation options are limited to a "good" or "evil" playthrough - you'll want to play it again and take a different path to see all the stuff you missed.